We went to "The Secret Life of Pets". It is absolutely as cute as the trailers make it seem. The plot deals with learning to get along and acceptance. There aren't just dogs and cats. There is a bunny, Kevin Hart does the voice of Snowball, parakeets, crocodiles, snakes, and a falcon, Tiberius voiced by Albert Brooks. Louis C.K. 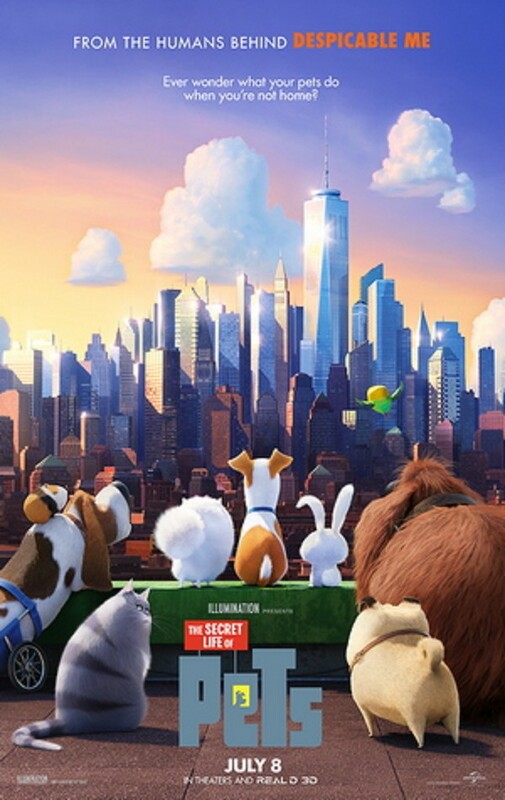 and Eric Stonestreet are the two main character dogs, Max and Duke. Jenny Slate plays Max's tough little love interest, Gidget. Max and Duke get lost while out with a dog walker and the rest of the story is their harrowing adventure trying to get home. The writers, illustrators and directors really had the animals down pat. People could be heard murmuring things like, "That's just like..."
It's a perfect show for young ones. If your child is overly sensitive or very easily scared it might not be for them. However it is perfect for us older kids. We loved it.